Movie and videogame trailers made such heavy use of dramatised, slowed-down versions of recognisable pop tunes for a time that the whole practice became a notable target of derision. I know that, and I’ve made fun of those trailers as much as anyone. BioWare has put out an Anthem launch trailer which features an orchestral remix of Ozzy Osbourne’s Crazy Train, and despite everything I just said I think I’m into it. The trailer features all the bombastic heroism you’d expect from a sci-fi meets fantasy meets action blockbuster. You’re gonna protect the world! You’re gonna get a cool robot suit! You’ll fight the unimaginable! You’ll feel the power of your Javelin and its precision! You’ll even get to enjoy a whole lot of explosions. But the centrepiece of this is that stringed arrangement of the driving guitar riff from Crazy Train. I can’t get it out of my head, and I need to bring it to you, too. And yes, mostly this article is an excuse to play some Ozzy at work. Or hey, just sit back and listen to the real Crazy Train. 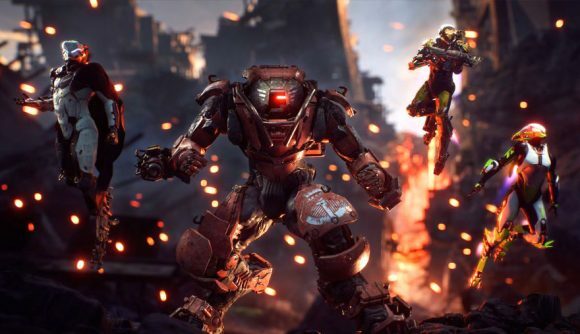 The Anthem release date is set for February 22, and you can follow that link for more info about the game. In the meantime, I’m still going to be mesmerised by this trailer, and those little “aye, aye, aye” bits that punctuate it. I know, it’s crazy – but that’s how it goes.